Imagine your job is taking huge gambles with other people's savings and pensions. Imagine also that the bets are arranged so that you are paid a fortune when things turn out well, but you don't lose anything much when they go wrong. How would you behave...? I think you might rapidly develop a hog's appetite for wild risk taking. And that is, in essence, what is wrong about the financial markets - the incentives of individual traders and managers are not aligned with the interests of those whose money they manage. The pay system based on big bonuses creates a sharp asymmetry in rewards for success and penalties for loss. There are no negative bonuses that penalise big losses. The worst that can happen is a few months gardening and a pay-off that would dwarf most people's regular pay. The institution, its shareholder or investors take the pain - not the trader or manager. It is this view of individual incentives that I think has been missing from the commentary on recent turmoil in the financial markets. People are asking why the companies took such risks... just look inside the companies at the personal risks taken by the people making the decisions and it is clear. They're all at it. 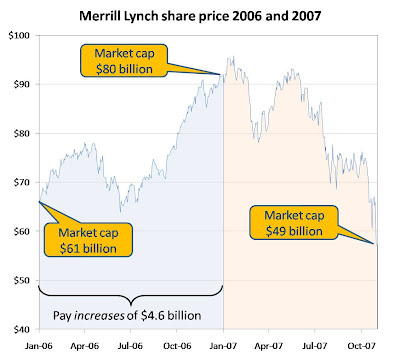 I don't particularly want to pick on Merrill Lynch. It just illustrates the incentive structure that works in financial markets and it is far from alone: see Biggest City bonuses ever [Evening Standard in 2006] and troubles at other investment banks like Citigroup and Barclays. The Northern Rock crisis was driven by a management determined to make aggressive use of a risky business model, placing all their investors at risk. In the end, they were bailed out with £30 billion of public sector loans [BBC]. It's the same basic model - profit from exuberant risk taking while times are good: let others take the pain when it all goes wrong. That's why it's no good asking Northern Rock why they didn't see the credit crunch coming - the individual managers (as opposed to the institution) had no incentive to look or to act differently. Quite the opposite. Annoyingly, it is very hard to see how this could be fixed. It would require an incentive structure that was multi-year, transferable between employers, and stuck with traders and managers even if they left the industry. No manager would accept it, and given the pursuit of talent, no employer would offer it. Any market that required it through regulation would find its institutions moving offshore. It is easier for the fund manager and institution to let the ultimate investor take the pain - as long as all institutions do it together. Which they do. The only sensible approach is caveat emptor or 'buyer beware' and distrust of promised big returns. Senior Wall Street executives can enjoy eye-watering pay packages by taking excessive risks during good times – something that only becomes clear when risk management is tested and is found wanting.[...] A radical shift on Wall Street is unlikely. But heads you win, tails I lose is no way to pay anyone. Note: Market capitalisation is calculated here as share price at the end of year multiplied by shares outstanding at the end of year as listed in the annual report for 2005 and 2006. Some interesting parallels with development banks here.. individuals are incentivised to get loans signed off, with no apparently personal downside if environmental (or other) safeguards arent applied properly. By the time it becomes apparent that the project is a stinker the person in question has moved up a level and are immune. Hope preparations for Sudan are going well. One of the Today programme's Thought for the Day speakers last week mentioned the Islamic disdain for usury. I had a quick Wiki look at what the Islamic banking system is based on and there is mention in there of both lender and borrower sharing in the rewards and the risks of investments. Might this be the way for Western capitalism to go? Yes - risk sharing is fundamental here... but risk and its allocation have slippery qualities. Someone might appear to be bearing risks, but what happens if they default and head for the exit? All contracts or investments involve a degree of risk-sharing - it is the balance and transparency that matters. It used to be said that risk should be transferred to those best able to manage it, but now we see it being transferred to those least able to understand it. Much of the recent problems have arise from failures to understand risk or to price it properly. I argue that this is an inherent weakness - market players don't want to or need to price it properly because they get out (ie. they shed the risk on to institutions) when things go sour.